Giving is caring - Chinese New Year 2016 with Coca-Cola | C A N D A C E .
Hey everyone, college is starting real soon! My results are out and I guess I’ll say that I did pretty well this time. Definitely way way waaaayyyyyy better than the previous semester. Remember my previous post on Coca-Cola’s newly launched limited edition Chinese New Year cans? I have finally decided who I’m giving which can to! Cheers to me because I’m personally a very indecisive person (选择困难症) which makes even the simplest questions like “What is your favorite colour?” a very tough question to answer. Now for the first can, this person is currently doing a pretty good job in running his business. And if the business is good, his employees will get more bonus too! Y’know like my mom hahaha. So for the Coca-Cola can ‘Prosperity in Business’, I will be giving this can to my mami’s boss! The next person is probably the most annoying person that I can never hate in my entire life because she has practically drooled all over me when she was a cute round little baby. This person is my little sister that has ngam ngam (recently) entered secondary school. Adapting form 1 life is not easy, especially when you are coming from a Chinese primary school background. So for this Chinese New Year, I will be giving her the Coca-Cola can that symbolizes ‘Academic success’ to wish her good luck in her studies. Every family is bound to have arguments once in a while. To me, arguments could bring the family closer as we would all learn to compromise and understand one another better. For this CNY, I will be giving my grandfather a can of Coca-Cola that symbolizes ‘Peace in Family’ also because when he saw the Coca-Cola gift set he has already been asking me when can he drink it hahaha. Now now now, this person has probably seen me in so many ways. Namely, lazy, hungry, tired, happy, very very hyper, sad, very very hungry and also my ‘suddenly occasionally hardworking’ mood. This person’s my main babe, the bestie. :> So she has pretty much been my ‘贵人’ for one too many occasions during secondary and trust me, I miss that so much. I miss not having the need to pay full attention in class knowing that there is someone there that is able to re-explain the entire econs textbook to me in a day’s time. I know I’m never really your ‘贵人’ but it’s ok!!! This CNY, I’ll wish you with a can of Coca-Cola that symbolizes ‘Benefactors Aplenty’ okkk? I’ll wish you to have banyak banyak (many many) ‘贵人’ around you ok! Now that I have this thing called ‘love life’ a.k.a I have a boyfie, the Coca-Cola can that symbolizes ‘Flourish in Love’ cannot go to others already kan! Because he loves Coca-Cola, this Chinese New Year, I’ll be wishing him with can of Coca-Cola! He’s been around so many times to witness me stressing over my assignments and blessing me with food whenever I get hungry (which is like all the time), plus he plays the guitar, so that’s why I love him hehe. 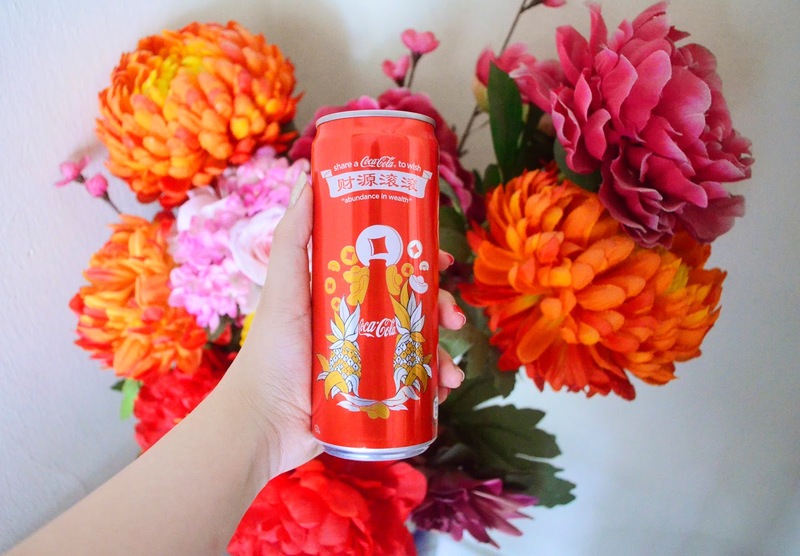 And don’t forget that if you want to win yourself a limited edition Chinese New Year Coca-Cola giftset like the one in the post HERE, remember to share your Chinese New Year celebration photos on facebook and Instagram with the official hashtag #CokeCNYmy ! Gong xi fa cai in advance everyone!